French President Francois Hollande appears as shaken as those he has tried to comfort one terror attack after another. Following the slaying Monday by two jihadists of a beloved 86-year-old Catholic priest as he was celebrating Mass in a bucolic Norman village, the French leader insisted the war against terrorists will be waged with “absolute determination.” But Hollande, as well as the security services, appear to be fast losing the confidence of the French public. Calls are mounting for tougher security measures to be imposed but Hollande and Prime Minister Manuel Valls, who was jeered earlier this month by furious mourners during a tribute to the Bastille Day terror attack victims, have offered little in the way of new, concrete proposals to prevent attacks. "Daesh has declared war on us,” Hollande said, using an Arabic name for the Islamic State terror group. 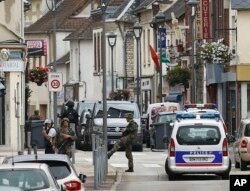 “We must fight this war by all means, while respecting the rule of law,” he added Tuesday as he comforted relatives of the murdered priest and villagers at Saint-Étienne-du-Rouvray near Rouen where two IS assailants slit the throat of Fr. Jacques Hamel in front of worshippers and nuns. Hollande’s predecessor, Nicolas Sarkozy, has dismissed the government’s response to the terror attacks as being hedged in by “legal niceties.” Opposition lawmakers are demanding the formation of a national unity government, arguing the threat to France is so grave nothing short of the state coming together as one will suffice. But the arguments over how to respond to Monday’s terrorism, which came two weeks after a man plowed a truck into a crowd of people celebrating Bastille Day in Nice, killing 84 and injuring more than 300, are widening sharp political divisions. And the political squabbling, along with the increasing sense among the French public of the state’s impotence, is adding to the risks of the emergence of “vigilante retribution” on immigrants, worry Hollande’s advisers. The Élysée Palace has two priorities, a Hollande adviser told VOA, to combat the terrorism and to prevent France from cracking under the stress of the attacks. In the wake of the Normandy attack, Hollande is trying to summon the sense of unity that followed the gun attacks on restaurants and the Bataclan concert hall last November in Paris that left 130 dead. But lawmakers say the “keep steady” approach is not convincing the public, who already question why the last two attacks were able to be mounted while the country is under a formal state of emergency. Skepticism is mixed with fury over the handling before the attack of the assailants. One of them, Adel Kermiche had been freed from jail just four months ago, despite being determined to join IS in Syria and making threats against churches. German police arrested Kermiche in March 2015 in Germany trying to reach Syria and sent him back to France, where he was given conditional parole awaiting trial. That didn’t stop him making a second attempt to get to Syria two months later, reaching Turkey before the Turks sent him back to France where he was detained in May 2015. Despite prosecutors’ strenuous protests, he was released in March by a judge he was persuaded by Kermiche’s insistence that he “regretted his attempts to leave for Syria” and wanted to settle down and get married. He was ordered to wear an electronic tag and could only leave his home between the hours of 8.30am and 12.30am on weekdays. According to court documents, Kermiche since the age of six had shown signs of “psychological problems” and throughout his childhood he had been regularly hospitalized. The head of the prison directors’ association, Jimmy Delliste, is scathing about the judge’s decision, which he dubs naive. 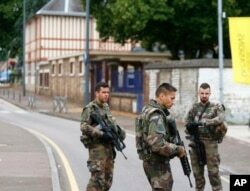 French soldiers stand guard as they prevent the access to the scene of an attack in Saint Etienne du Rouvray, Normandy, France on July 26, 2016. French newspaper Le Figaro reported the church at Saint-Étienne-du-Rouvray is suspected of having been on a list of Catholic places of worship near Paris drawn up as possible targets by Sid Ahmed Ghlam, an Algerian student arrested last year after murdering a mother-of-one during a failed attempt to attack a church in Villejuif. In neighboring Germany, which has suffered four terror attacks in the past week, Chancellor Angela Merkel is facing mounting public criticism, too, with recriminations flying over her controversial open-door policy for refugees that critics argue has contributed to the upsurge of violence. And as more details emerge of the background of the Syrian asylum seeker, Mohammad Daleel, who blew himself up Sunday in Ansbach, injuring more than a dozen people, criticism is turning into anger. According to IS Daleel had fought for al-Qaida in Iraq, pledged allegiance to IS in 2013, and after being wounded he left for treatment in Europe.